March, the time of year when all the stores are inundated with Spring and warm weather fashions - yet here in the Midwest we are still in the grips of Mother Nature & much cooler temps. Lets see this past weekend it snowed! In an attempts stay true to the reality of the temps, yet while bracing Spring Fashion I'd thought I'd start a new series on the 'ole blog. Now & Later. How to wear something now and then later - how to transition it into the next season! Fun right?! Nothing like buying something and getting to wear it now, vs having to hold onto it for some months. First up - major spring trend of 2012 printed and or Floral Denim. There are a wide variety of versions out there and all price points - I personally am most drawn to the more subdued and neutral versions, like these Citizen 'Mandy's'. Are you getting any printed/floral denim this year??? **The aviators, watch, purse & scarf could easily be worn in each! Gotta love that! Classic pieces will always go the distance in your wardrobe! PLEASE come to NYC and go shopping with meeeeeee. I need these jeans...yesterday. I love the COH floral jeans. I tried them on at Anthro, but decided not to get them. I still think I'll end up getting a pair of floral jeans soon. I am all about the printed jeans these days. I just did a post of my new tribal print jeans and I'm waiting for a pair of polka dot jeans to come in the mail. 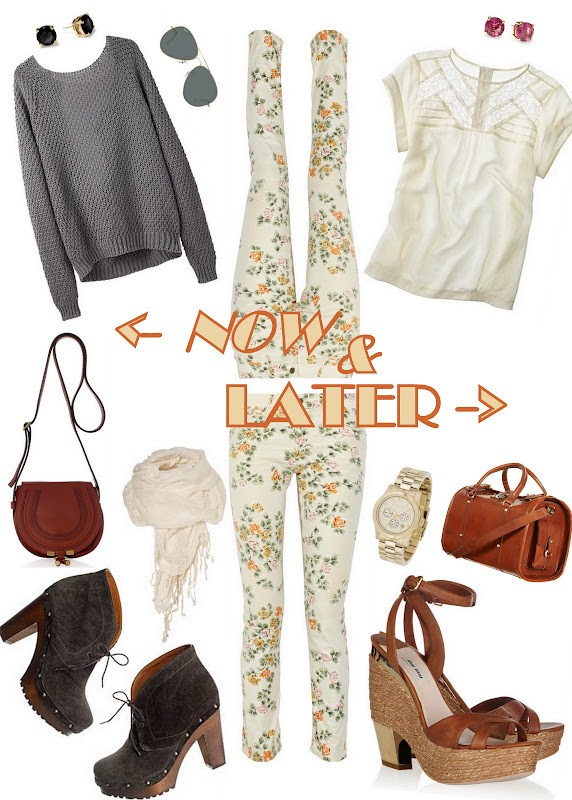 I love the floral pants with a more chunky sweater! Ok I am seriously obsessed with both of these looks! I would definitely wear these now + later. No floral pants in my closet yet - still torn on this trend! I'm thinking of investing in a floral top or accessories though. I'm just afraid to spend a lot of money on floral pants. I haven't gotten up the nerve to try them yet, but your styling suggestions are pure brilliance. I want both of those outfits! I am loving the floral denim so much! Both looks are so fabulous! Oh gorgeous gorgeous! I love! this is too perfect to even say! love it! This is brilliant. I absolutely adore this, and can't wait to see what else you come up with! Oh Taylor, I love this! Such a gorgeous post, and now I really want some floral denim! i love the outfit you put together, esp that blouse!! I love both the now & later looks! Need to invest in a floral jean print! Great looks! I am so loving the floral pants trend. At first it reminded me a bit of my floral leggings growing up but i've gotten over that and want a pair of my own!